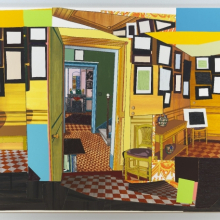 This work was inspired by Mickalene Thomas’s 2011 residency at the house and gardens of the French Impressionist painter Claude Monet (1840–1926) in Giverny, France. Thomas responded strongly to the colors Monet selected for the rooms of his house, the collection of art that hung on the walls, and the views of the garden that were deliberately framed by the windows. The Giverny residency coincided with her adoption of interiors and landscape as motifs in her own work. One of Carrie Mae Weems’s best-known bodies of work, the Kitchen Table series explores human experience not only from the vantage point of a female subject and viewer, but also from an African American point of view. The series revolves around a woman played by the artist. Each setting includes the same table with an interrogation light overhead. An individual generally appears with the artist in each frame; there is also a place for the viewer at the near end of the table. 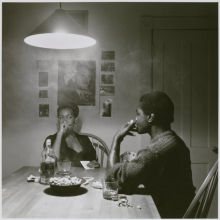 In this instance, Weems sits—perhaps wearing her “poker face”—in front of a photograph of Malcolm X as she plays a game of cards with her male companion over cigarettes and alcohol. Alison Elizabeth Taylor’s Security House examines the contemporary landscape and culture of the southwestern United States. 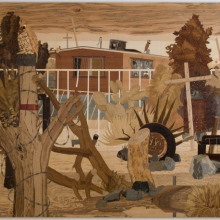 She uses marquetry, a woodworking technique dating from the Renaissance, to depict a dilapidated tract house amid an unkempt yard. Selecting wood veneers in a variety of grains and earthy desert tones, she embellishes the scene with details that suggest narratives relating to housing foreclosures and fears about border security. Security House taps into a long-standing romance with the American frontier, while also suggesting the persistence of boom-and-bust cycles that have historically characterized towns in the West. 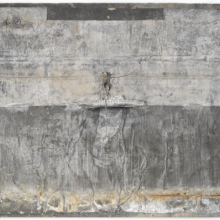 Like much of Anselm Kiefer’s work, Naglfar references myth and history. In Norse mythology Naglfar is the boat made from the nails of the dead that carries men into battle with the gods at Ragnarök, the end of the world. Here the boat’s placement on a battered, metallic sea also recalls World War II gunboats, possibly alluding to one of Kiefer’s recurring themes—German history, particularly the rise of Nazism. While symbolism and narrative play important roles in this work, so do its materials—real nail clippings and nailed-on sheets of metal. Combining elements of painting, sculpture, and installation, Naglfar is a multilayered work that evokes a similarly complex past. Power Flight takes painting off the wall and into the space of the gallery. 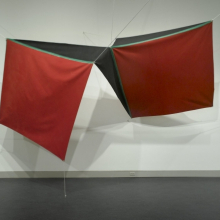 Freed from the confines of a rectangular stretcher, the canvas, composed of five triangles sewn together, is pulled taut by ropes anchored in the ceiling, wall, and floor. The resulting angular shape suggests the sort of small nomadic shelters that fascinate the artist—structures easily assembled and disassembled by individuals in flight from threatening situations, both natural and human-made. The bold combination of red, black, and green alludes to the colors of black liberation. Power Flight is part of the Flight Pattern series, initiated while Overstreet was living and teaching in the Bay Area. He and a partner now run a gallery in New York committed to presenting the work of artists of color and other artists who are underrepresented by major cultural institutions. 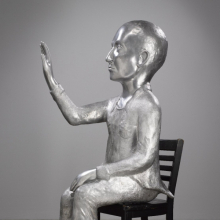 Kiki Smith’s Annunciation continues the artist’s long exploration of monumental sculptures of women that examine both the physical and psychological aspects of the body within a feminist context. The figure, with its suit and bald head, is gender-neutral. Its oversize head, delicate features, and dangling feet convey a sense of vulnerability, while its upraised eyes and outstretched arm suggest engagement in a rich inner life. Drawing upon her Catholic upbringing, Smith uses the Annunciation—the angel Gabriel’s revelation to the Virgin Mary that she will conceive Jesus—as a metaphor for the moment of creative inspiration. 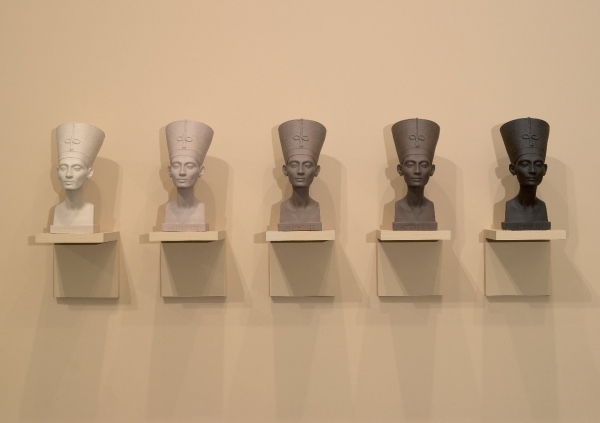 The works of art in these galleries use the formal elements of color, line, and shape to suggest narratives that reveal themselves directly or disclose themselves more subtly over time. The selection shows that the languages of figuration and abstraction are equally capable of telling tales and evoking the untold. The stories they call forth are shaped by literature, history, film, and current events, as well as sights and sounds encountered in daily life and nocturnal dreams. Together, the works present a wide range of contemporary media and materials, sometimes unconventional. Unfolding Tales highlights our recent acquisitions and presents them alongside notable works that have entered our collection over the past four decades. In collecting contemporary art, we now focus on works of the twenty-first century, which has seen the rise of Brooklyn as one of the most vibrant centers of cultural production in the world. Williamsburg, Greenpoint, and DUMBO—now established artists’ enclaves—have given way to Red Hook, Bed-Stuy, the Gowanus Canal, Bushwick, and Sunset Park as frontiers that offer artists prospects for affordable studio spaces. We began collecting recently created works of art in the mid-nineteenth century. Unfolding Tales demonstrates our continuing commitment to living artists and to collecting distinctive art of our time. 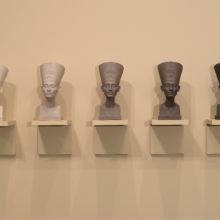 The exhibition is organized by Eugenie Tsai, John and Barbara Vogelstein Curator of Contemporary Art, and Rujeko Hockley, Assistant Curator of Contemporary Art, Brooklyn Museum. The generous support of the John and Barbara Vogelstein Contemporary Acquisitions Challenge has made possible many recent additions to the collection featured in Unfolding Tales: Selections from the Collection. This exhibition was also made possible in part with support from the FUNd. The creation of the contemporary galleries was made possible in part through support provided by the New York City Council through the efforts of council member Bill de Blasio.